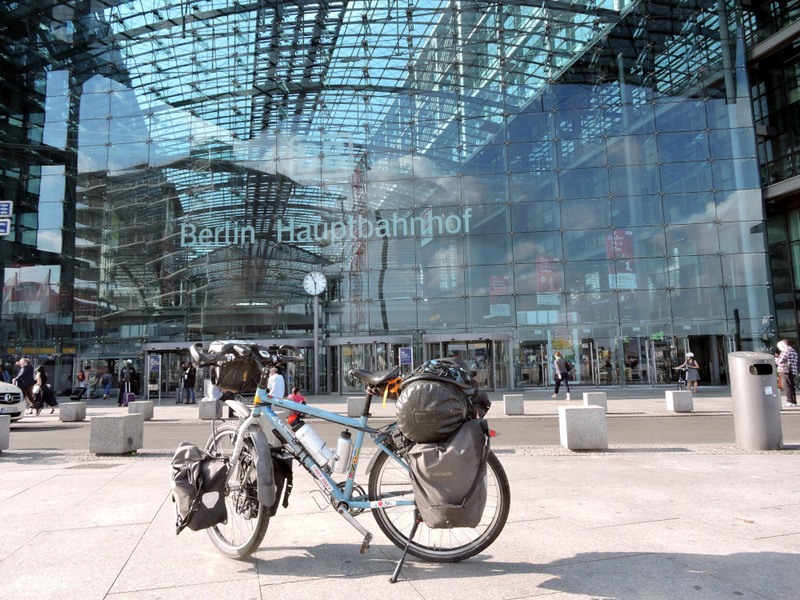 After many hours on the train, I finally arrived in Berlin. It was already late in the afternoon but still very warm and sunny. I wanted to call a friend who had invited me to stay. Suddenly there was warm liquid running down my leg. A large boxer dog had relieved itself against me. Unbelievable! Welcome to Berlin! I got up and screamed. 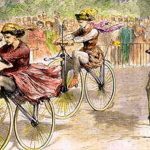 The two neatly dressed ladies were embarrassed. “It’s still so young” which didn’t really count as an excuse. They gave me a tissue. Another young woman was more helpful. She gave me a disinfectant wipe which she always carried in her purse. 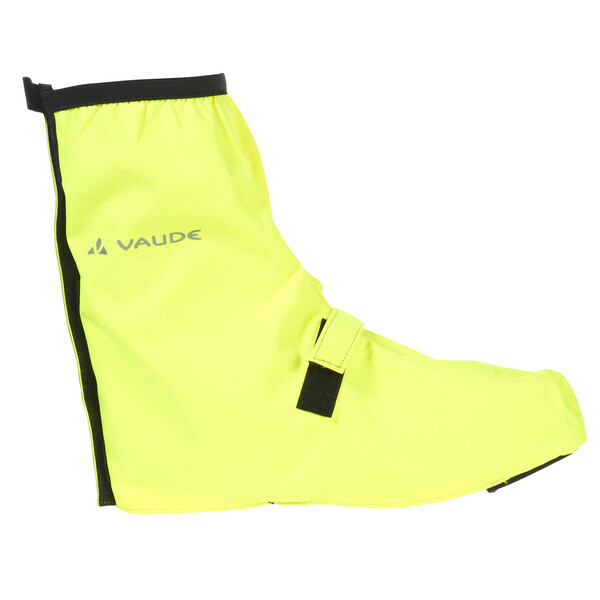 Would I need them for the future? It was amazing how many cyclists were in town. I wondered whether it was because of “bike week”? In any event, it was great. On the way to Kleinmachnow I cycled through the countryside and didn’t really notice that I was in a large city. In the evening we celebrated in style my arrival and the start of the tour. Before my departure on this tour, I had to take care of many things and didn’t have time to prepare for the trip. Better to stay an extra day in Kleinmachnow. From there it was a short distance to Potsdam. It was beautiful to ride through the forest. 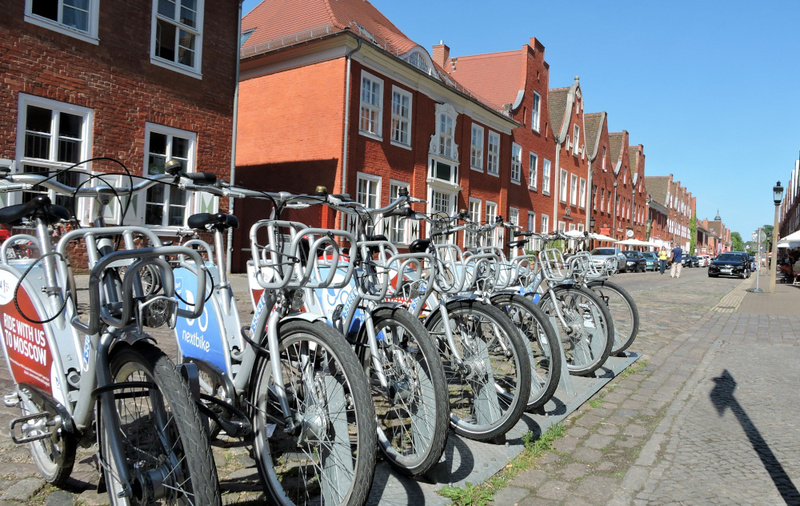 By now it was so common to see rental bikes in all larger towns. 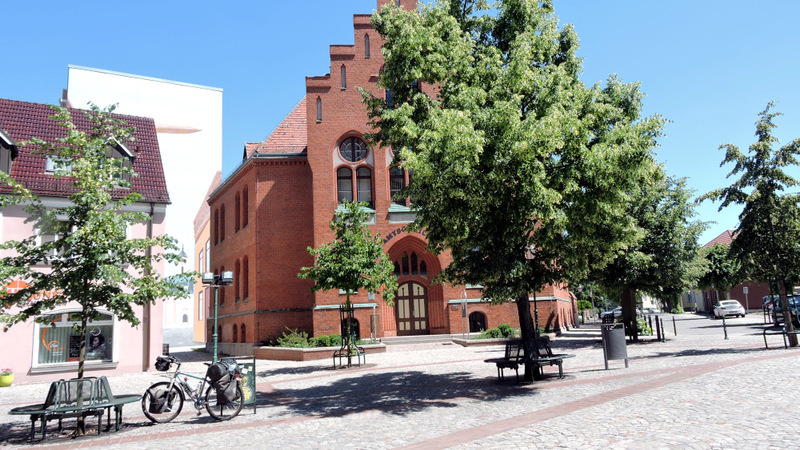 And the traditional red brick buildings, nicely restored. Later on, we went to the beer garden in Wannsee and the sun was setting over the lake. Almost like in Africa. The main difference were all the jet streams in the sky over Berlin. In Africa there was no crossing out of the sunset. Then it was the start. I had only a rough idea about the route. I took a very pragmatic approach: my map of Poland started near the northern town of Schwedt/Oder and I aimed for that city. 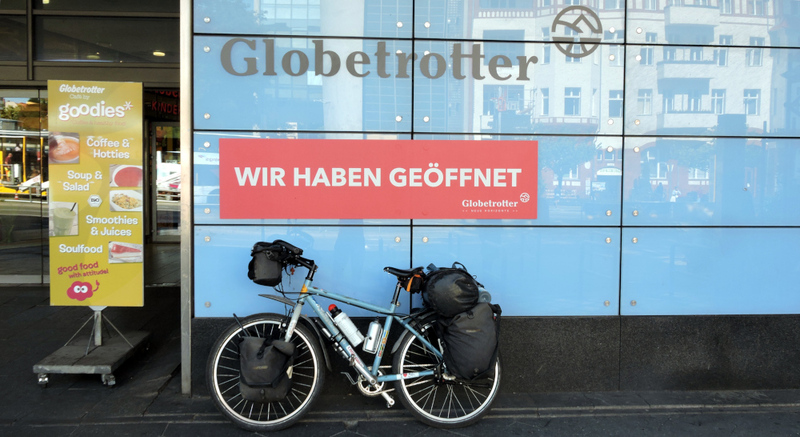 I had to ride right across Berlin and came past the Globetrotter store (which is a great shop for outdoor gear). First time ever that I didn’t feel the need to enter. 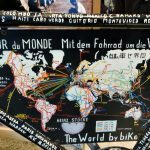 It was pure luxury to cycle past a Globetrotter shop and to know that I had everything. After about 30 kilometers I was in nature. 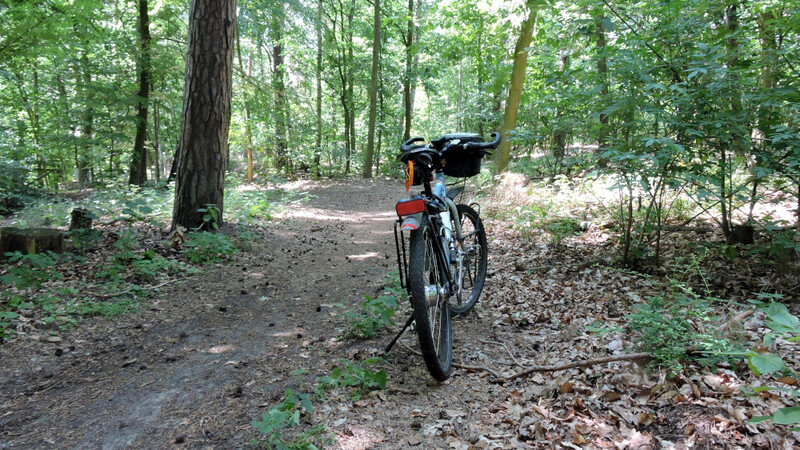 On new bike trails I went to Bernau. I took a break at Henkershaus. Between the 16th and 17th century a few men and women were tortured and killed here on the allegation of witchcraft. 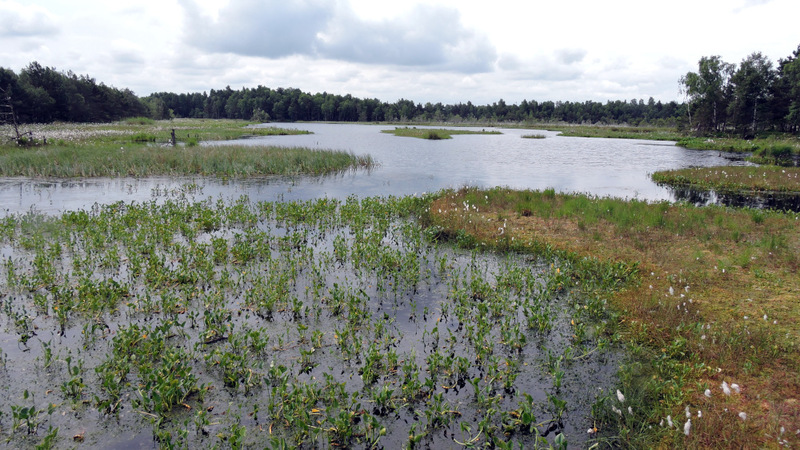 After Eberswalde there was one nature park after the other. The vegetation was prolific, and I assumed stealth camping was forbidden. 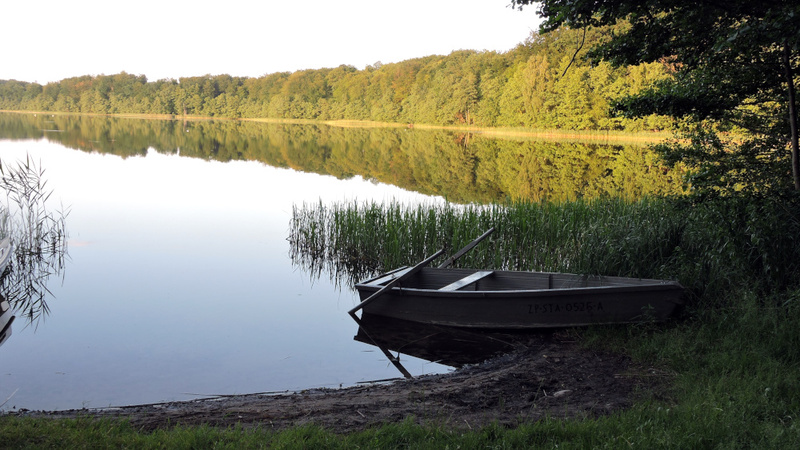 The GPS located the next campground which was a beautiful one on a lake near Pehlitzwerder. By chance I met a woman there who also used to work for Schweizer Pharma and we chatted for a very long time. I had missed that during my five months in Germany: to meet people and to have interesting conversations. Then I went for a swim because there is nothing more relaxing after a bike ride. It was still daylight when I retreated to my tent. The days were so long that I didn’t need to rush in the mornings. And fortunately, it wasn’t too hot. On the way to the river Oder there was again a series of nature parks which were marked by these owls on the signposts. 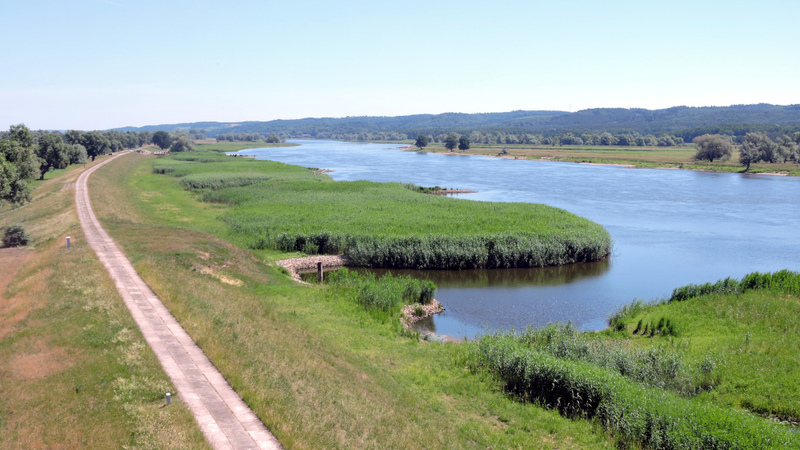 Before I reached Schwedt, I cycled for a bit on the Oder bike trail. 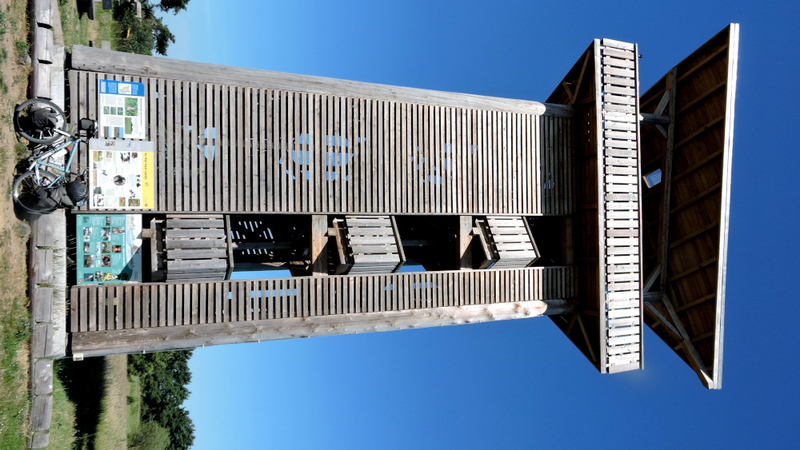 This tall viewing tower wasn’t only suited to watch the birds. 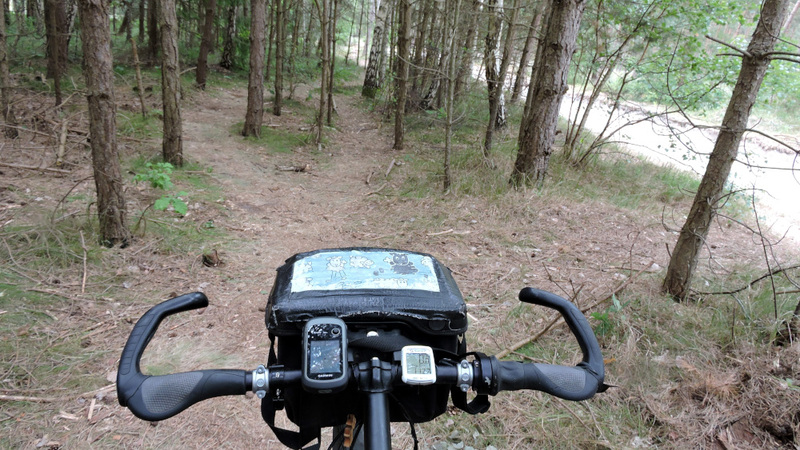 Such bike trails weren’t very exciting for me and I was glad when my GPS found a more adventurous track. 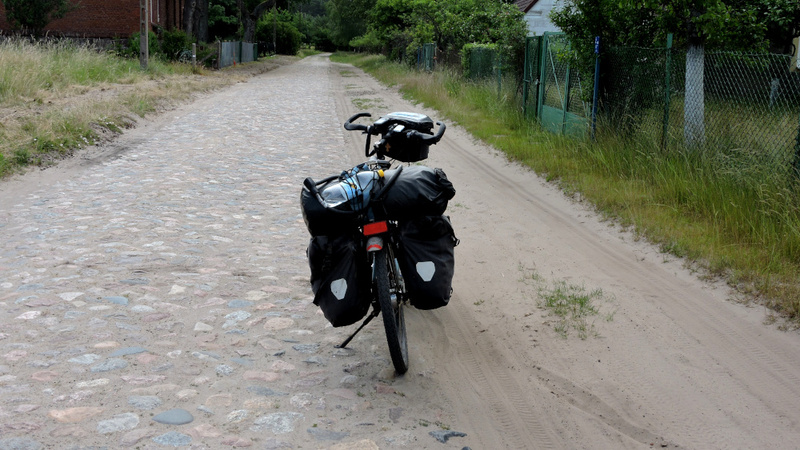 It was incredible how many roads there still were in the east which were made for tanks or were made of cobblestones. Schwedt was a cute town with typical red brick buildings. I went shopping before I crossed the border. No doubt, I was now in a different country and I couldn’t understand a word. I didn’t turn left but rather right into the forest. It wasn’t an official road and it unpaved and without traffic. I rode past many small villages. No one paid any attention, what a difference to Africa. 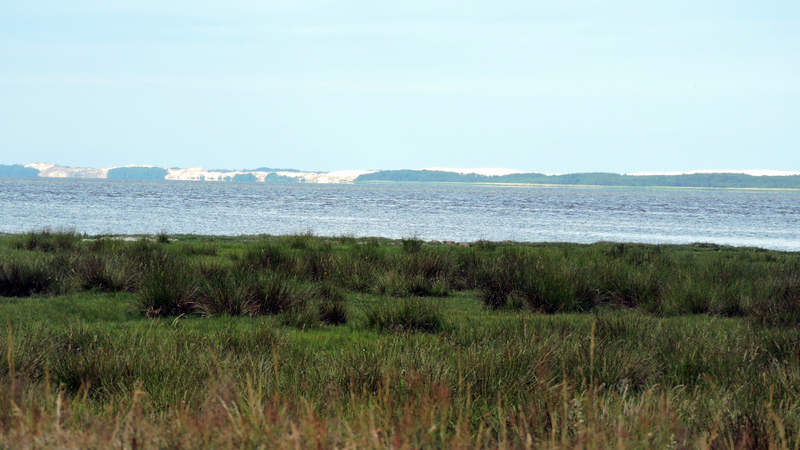 At times the tracks were hard to cycle on because of the sand but the surroundings were idyllic. This area wasn’t touristy at all and there was no campground. There were many lakes for the locals to cool down and there was much activity on account of the good weather. I was surprised that there was little German or English spoken and people didn’t look particularly happy to see me. In the evening I asked a young family. A young man was assigned to communicate with me in broken English. He told me that after a few kilometers I’d come to a restaurant and I should ask there whether I could camp. The young waiter was the first person who could speak English and didn’t mind if I camped behind the parking lot. A bit further on there was a lake which was perfect for stealth camping. 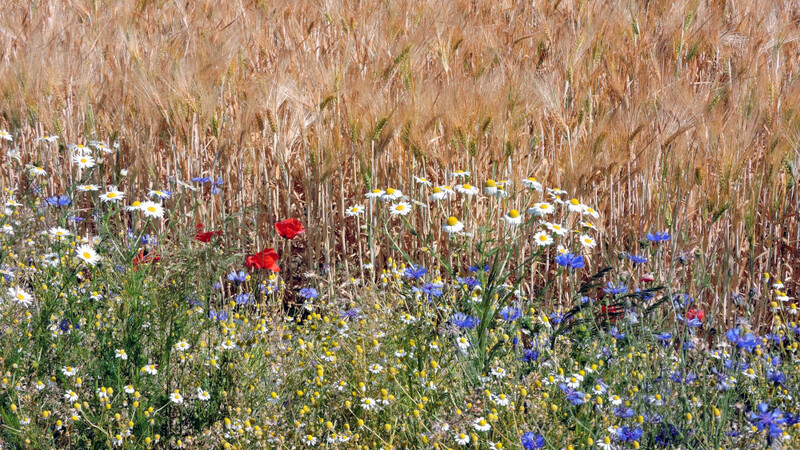 I assumed that behind the fields no one would find me. Only in a morning an angler arrived but by then I was ready to leave. In the morning I discovered that the map hadn’t loaded properly on my GPS which meant a longer stay at the beautiful Miedwie Lake. When I arrived early on, all the stalls were still closed and it was very quiet. 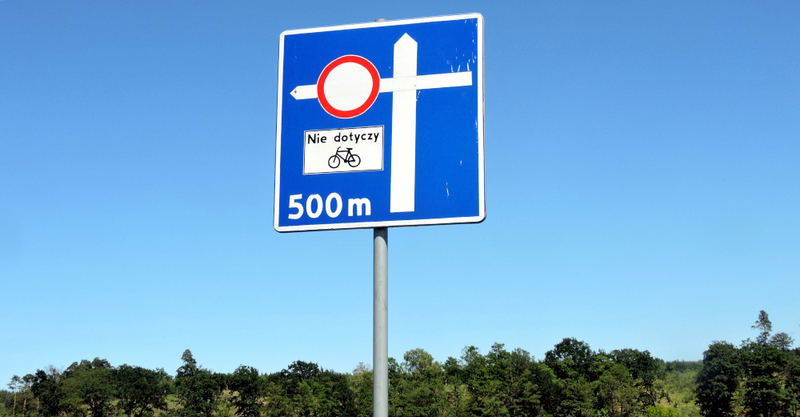 In Poland there was fortunately good mobile cell phone coverage almost everywhere. Nevertheless, it took almost three hours until I had a functioning map on my GPS. By then the beach had filled up, the booths had opened, and it smelled of grilled sausages and waffles. People just passed me by, one or two greeted. An older woman addressed me first in Polish and then in very good German. 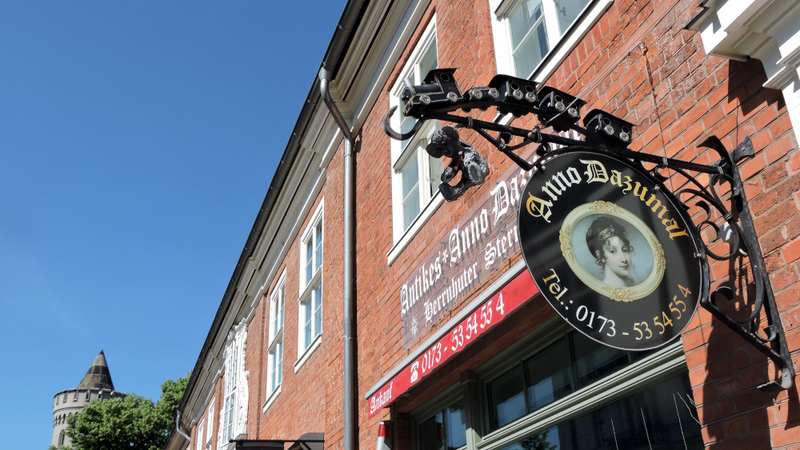 Maybe people didn’t want to speak German? 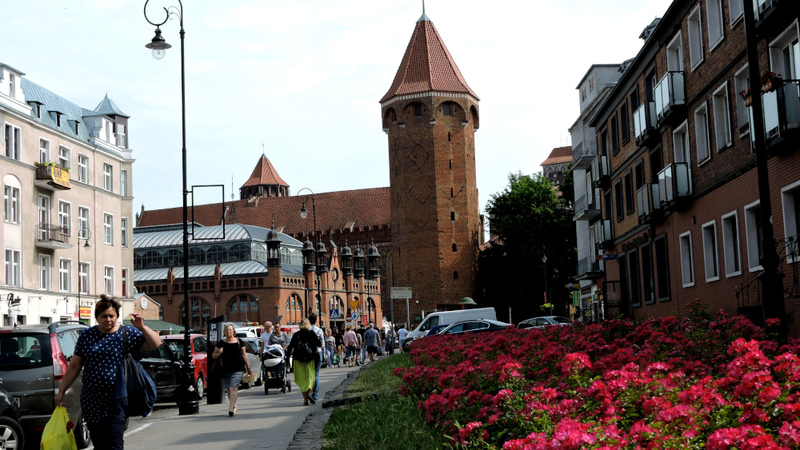 Stargard was the first larger city and there was more traffic. 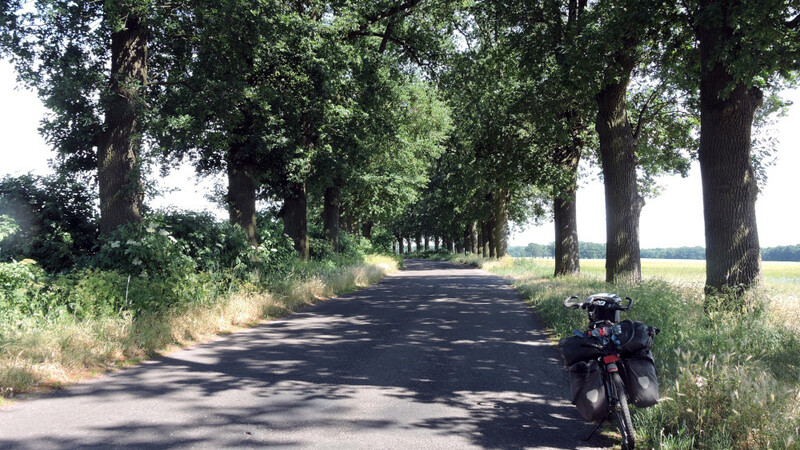 I continued and turned into one of the many tree-lined roads. They were magnificent in the sun and wind. I passed through small villages, which churches dedicated to the Virgin Mary and Cistercian monasteries. 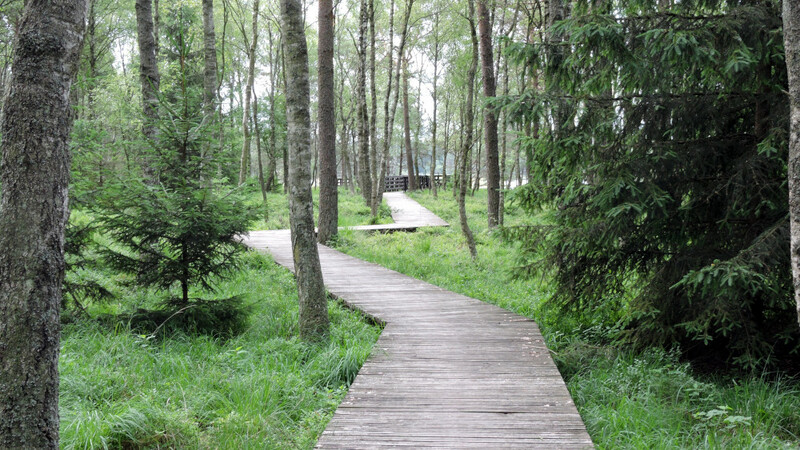 In the evening I arrived in the nature park of Krajoprazowy. Right on the lake there was a small campground, really only a fenced in lawn where two couples and a man with their camper vans had parked. The man spoke German but was grumpy about it. But the people were nice and allowed me to camp. Shortly thereafter I was in the lake. I stopped counting the lakes which I passed because there were too many. 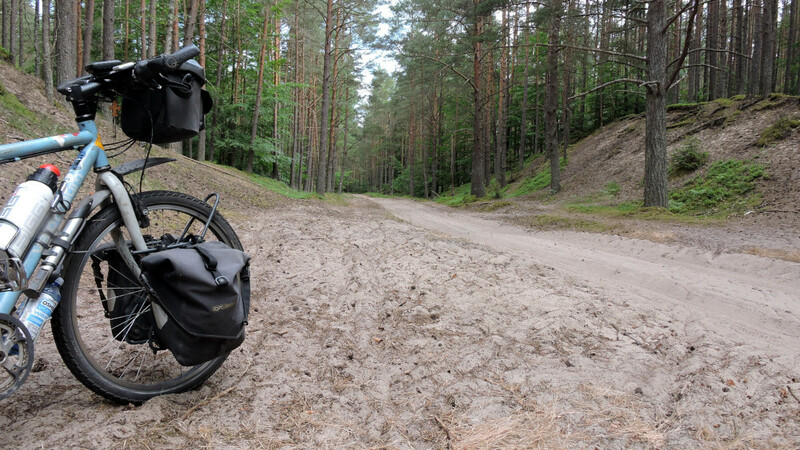 At times the track was very sandy and I had to push the bike. 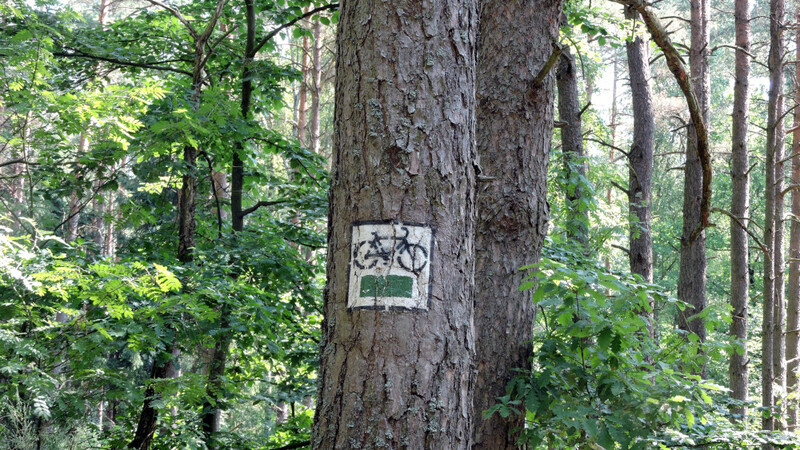 Never mind how bad the trail was, there was always a sign for a bike path painted on a tree. From where and where to? No idea. They came in different colors. Now there were more official campsites and I wanted to stop earlier in the day. I should have realized that the sites by the lakes would be completely filled up because of the beautiful weather and the weekend. I made quick progress on the bike path,. There were plenty of opportunities for stealth camping but it looked like rain and I didn’t want to be in the middle of the forest. On a rail-to-trail path, I sailed away with strong tailwinds. I didn’t really know where I was going but it was more or less in the right direction and it was a lot of fun. And as suddenly as the path had started, it stopped. 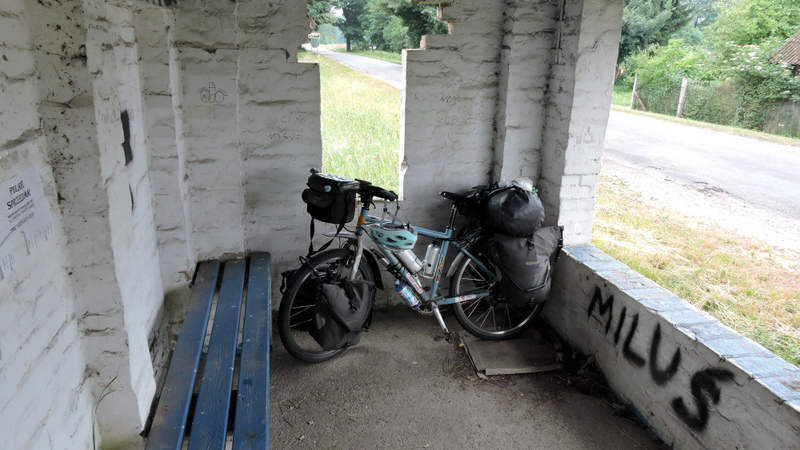 I arrived in Pobczyn Zdroi which wasn’t a place where I wanted to stay. 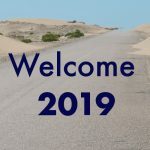 I continued through the forest and arrived at a bus station in the next village when the first rain drops started to fall. When thunder and lightning began, I decided to pitch my tent in this shelter. Across the road lived an old couple which had been alerted to my presence by their dog. I waved to them and like everyone else, they let me be. Next morning the old woman came over. She was quite nice and offered me water. Of course, she spoke only Polish. I made out by her gestures what she wanted to know, and it was the same as everywhere else in the world: did I travel alone and wasn’t I afraid? Fortunately, the rain stopped in the morning. 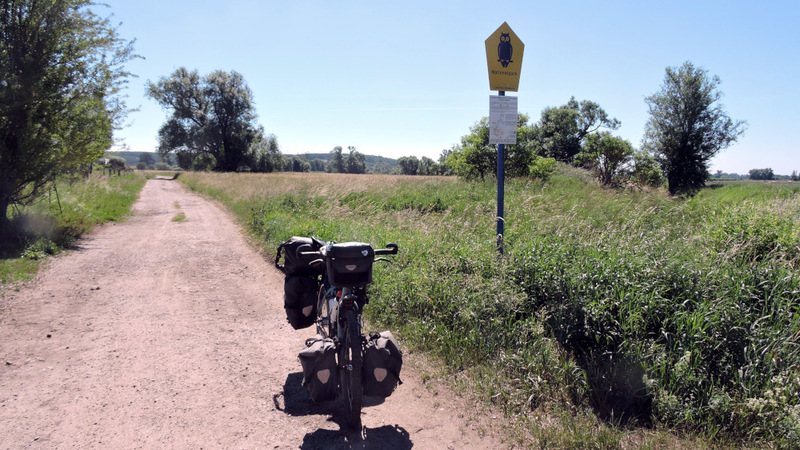 However, I decided to continue on the small paved road until I reached Koszalin where I joined the R10, the Baltic Sea Bike Trail, and I stayed on it as long as possible. Dabki was beautifully situated between a lake and the sea and it was the first of many tourist villages. The road was lined stands for ice cream, waffles, hot dogs, and souvenirs. But there was also the bike path. And there was a lot of activity. 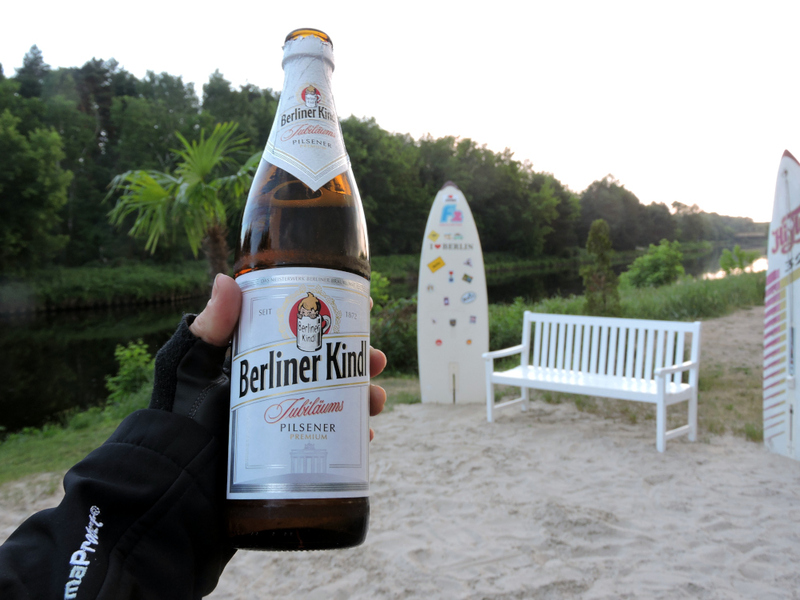 I found a campground at the river in Darlowo with a lot of German RVs. Finally, I had my first shower and bear in Poland. And then my first view of the Baltic Sea! Apart from that Darlowko had the same to offer as Dabki. 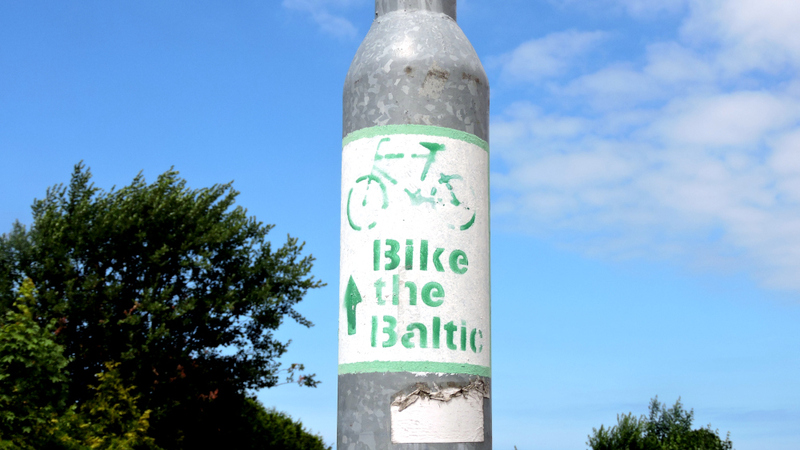 Soon the first sign appeared that the bike path would be blocked further on. At first, I wasn’t concerned and continued on the cement tracks that had been laid for the tanks. Then the detour started. I didn’t feel like taking it. A local cyclist arrived from the blocked direction. Using gestures, I asked whether I could pass, and he confirmed. It was beautiful and only twice were there short sandy stretches where I had to push. Ahead of the next town, the path was being completely redone. 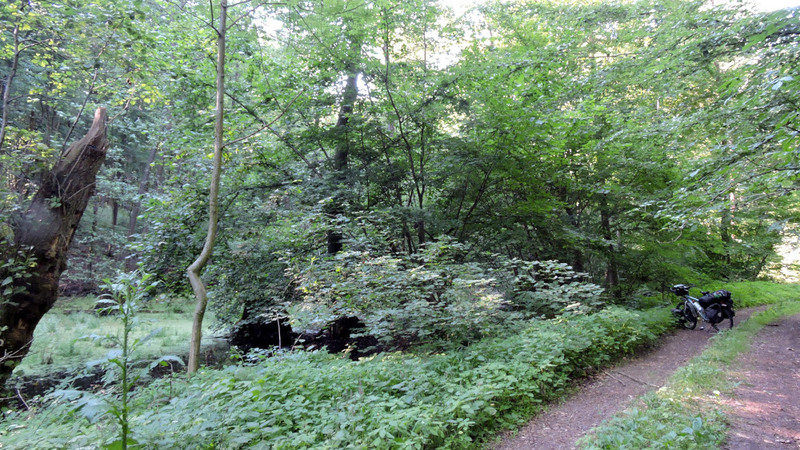 But a small trail had been made in the forest. 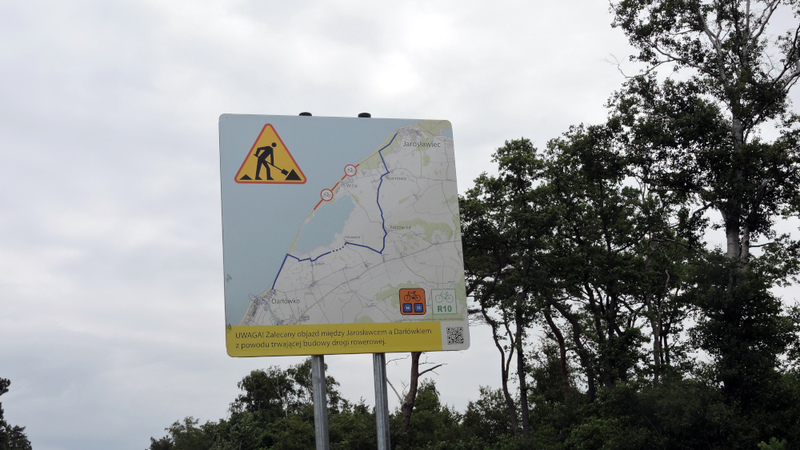 After Ustka I continued on a road without traffic. Nevertheless, there was a red, well-marked bike path. 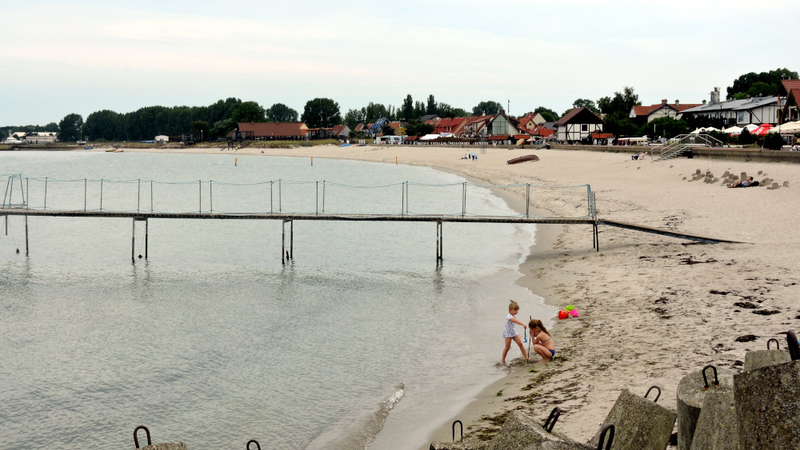 Whose German name is Stolpemünde, made the best of the blows that history dealt it and turned into a nice holiday town. There were many timbered houses. 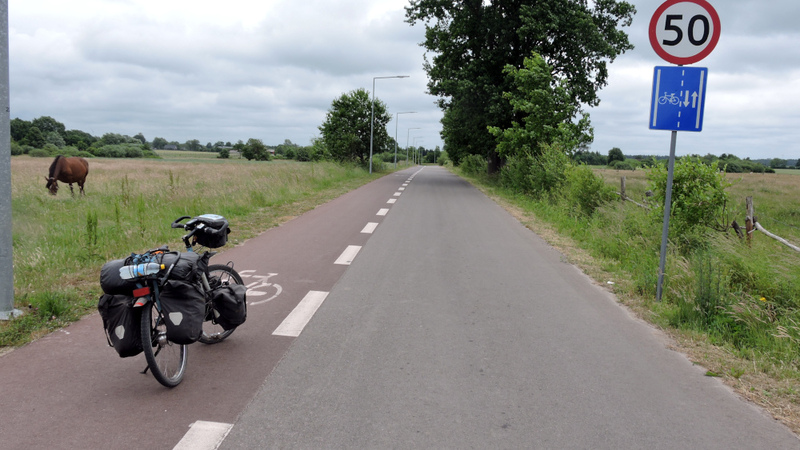 First it was easy to follow the well-marked R10 bike trail. 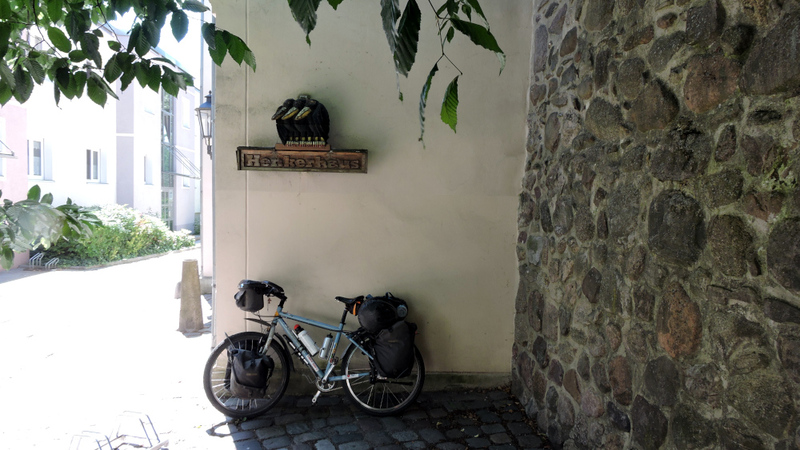 But then I lost the route and perhaps by lucky chance I found myself on a paved road which often turned to cobblestone when it passed through towns. During a break I discovered that there should be a campground after another 20 kilometers. 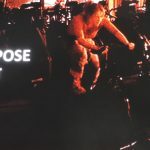 I had already cycled quite a distance but now ambition got the better of me and I wanted to reach the place. 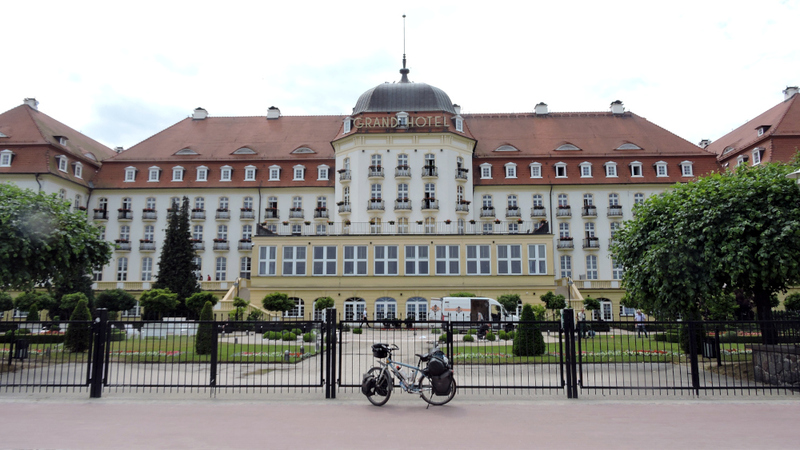 For the first time on this tour, I biked more than 100 kilometers, almost 110. I was pretty tired but happy to have made it. Sometimes I need such challenges even so I know they weren’t really good for me. It was a nice, empty, and quiet spot and the hot shower felt very good. Next morning, I hadn’t quite recovered and then had to face long sandy stretches where I needed to push. Sometimes they had built nice platforms for bird watching. I managed to get stuck in the sand. Fortunately, I could enjoy those dunes which move over time (Wanderdüne) from a distance. When I reached the town of Leba, I bought two Cokes and a chocolate and devoured them immediately. 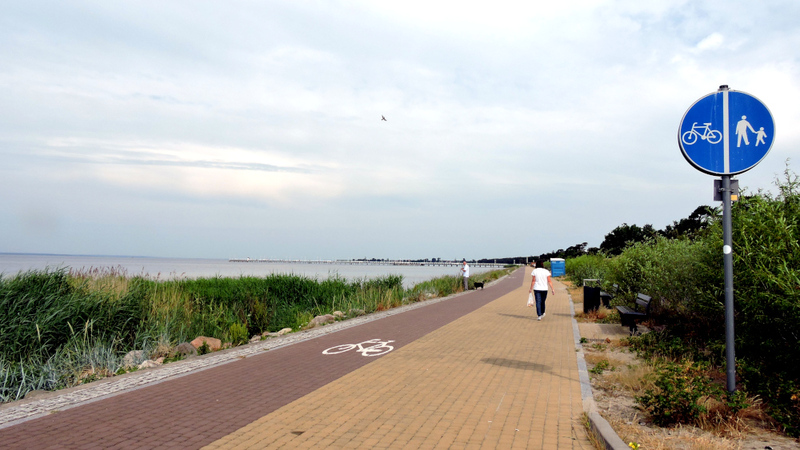 Then I asked at the tourist information office whether the rest of the R10 bike path would also be sandy. Yes, unfortunately but the road was paved. And what did I do? I stayed on the bike path. I must have a masochistic streak. It was further on that I chose the road. 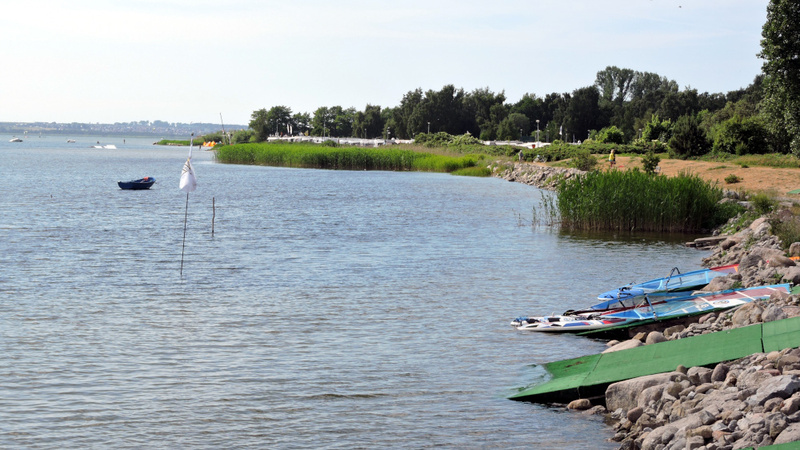 When I reached the camping site in Osetnik, I didn’t hesitate even so it was only early afternoon. I had had enough and was exhausted. I pitched my tent, showered off the dirt, and then slept. Fortunately, every day was different. After Osetnik the trail continued through the forest but it was in excellent condition. And for a change the R10 was now well marked. 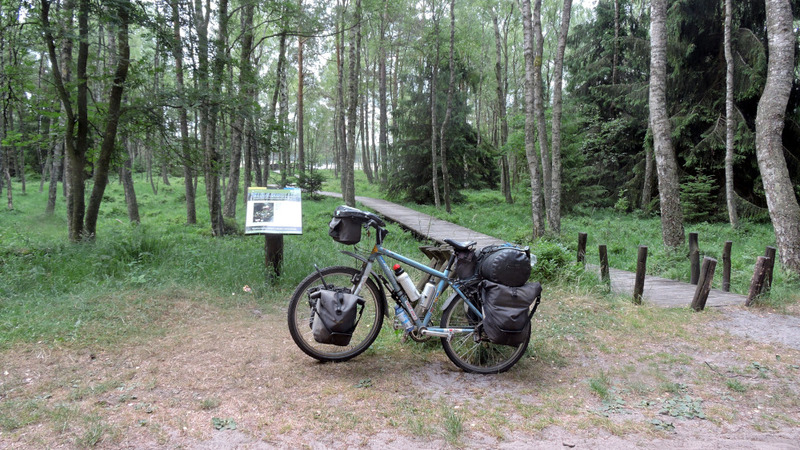 In the middle of the forest I met a German couple which had started their bike tour in Tallin. Today I had a break from the sand. I made good progress even when the bike trail wasn’t any longer well marked. 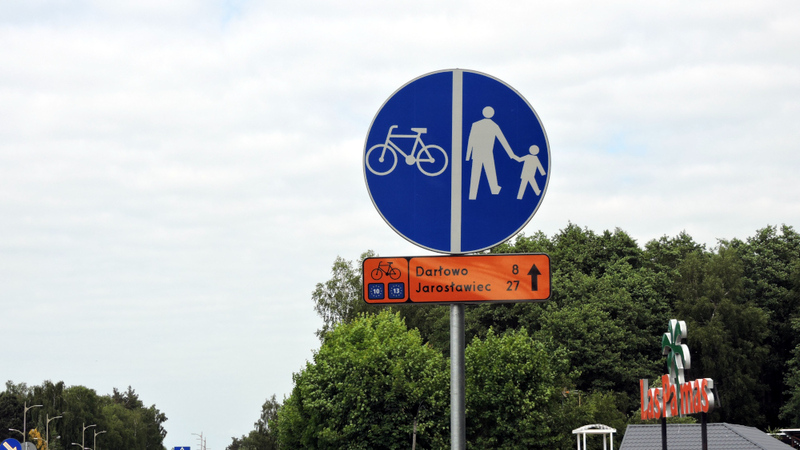 I had the impression that in Poland every track through the forest was a bike path. Everywhere there were bikes painted on the trees. When I reached Jastrzebia Gora I rested on the beach. For the first time, an old woman approached me and asked whether she could sit down. Her English was surprisingly good. Finally, someone I could asked how the Poles viewed the Germans. She told me that today they liked the Germans but because they suffered through World War II and the German occupation, there were still concerns. 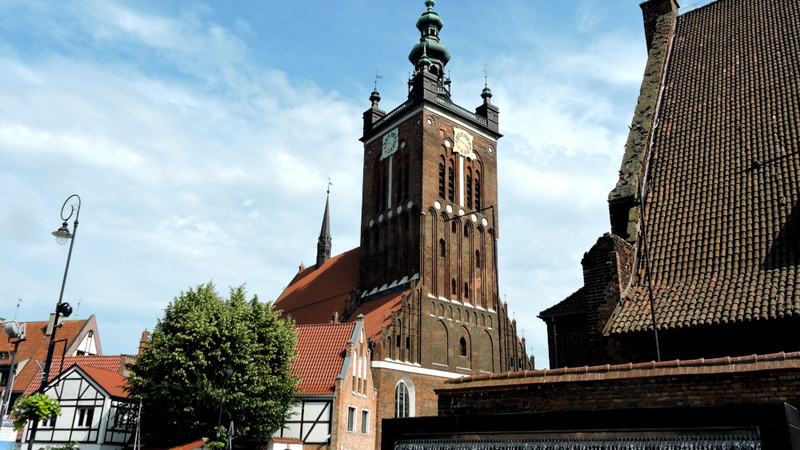 Poland was the first European country where I didn’t see any people of color. The woman laughed and said, the government had decided so. They didn’t allow them to enter the country. She didn’t support the government but, in this case, she agreed. She didn’t want that such people could come to Poland. She thought that Germany had made a mistake to accept so many refugees that that it’d pay the price for it. Maybe I managed to sway her negative opinion a bit. It was always very effective when I spoke about my trip to Africa and the positive experiences I had had. 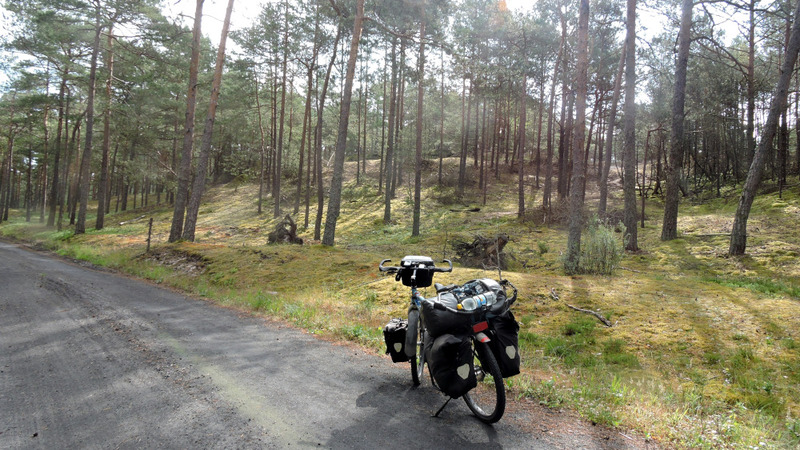 The Hel Peninsula was supposed to be very pretty and so I chose that route. From beginning to end there was a bike path. At times directly at the bay which was also a surfers’ paradise. There were camp grounds in quick succession and I choose a quiet one in the middle of the peninsula. 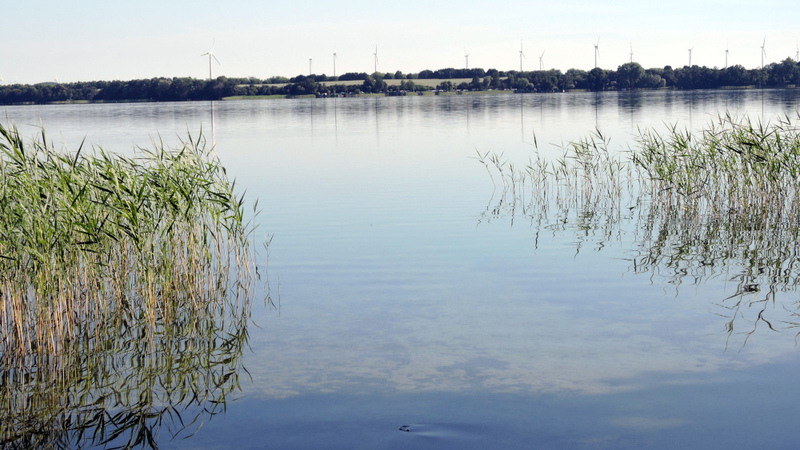 The next day I continued to the end of the Hel Peninsula. 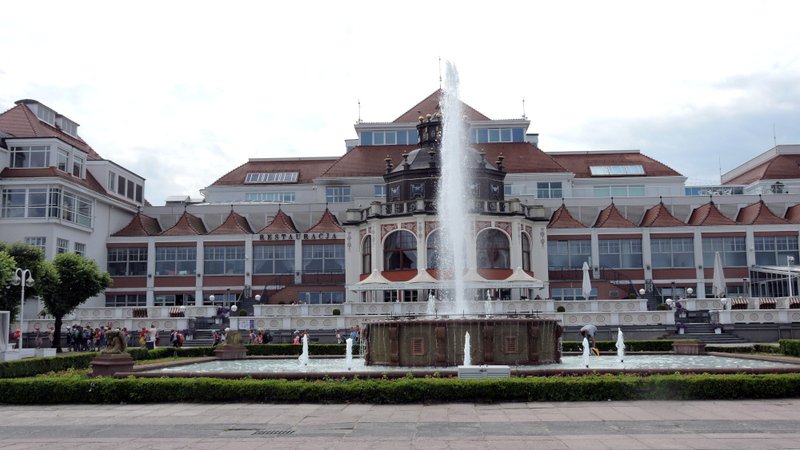 It was a place with a lot of history, military monuments, and museums. 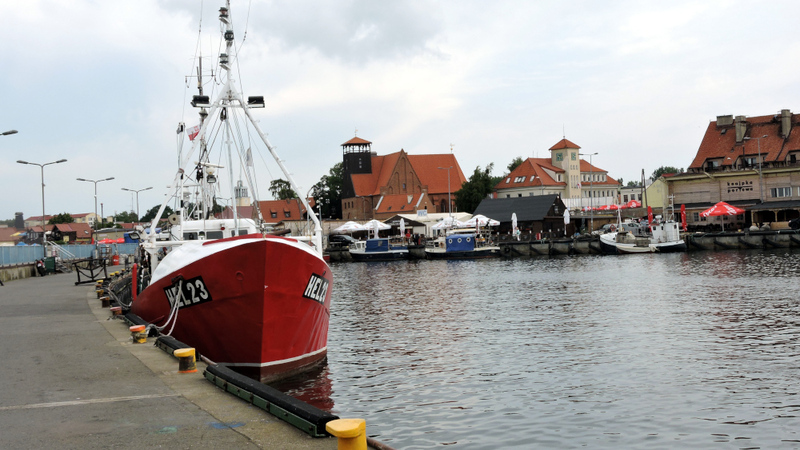 I thought that there would be a direct ferry to Gdansk. But apparently not every day. 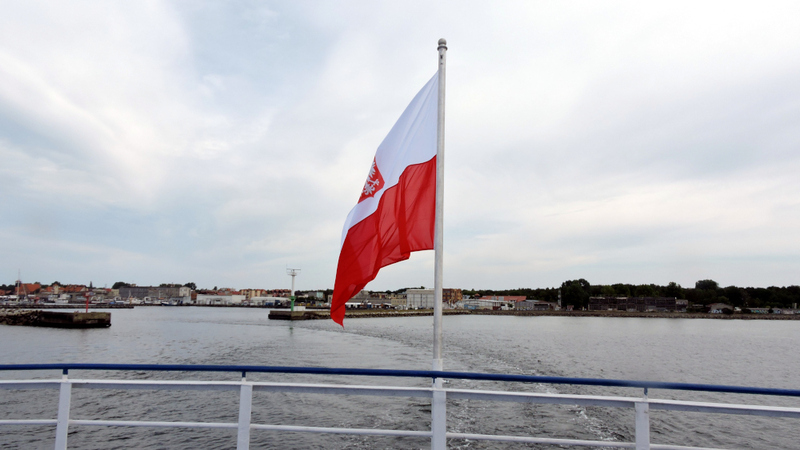 There was only a ferry to Gdynia, about 20 kilometers from Gdansk. It didn’t make much of a difference to me on a bike. 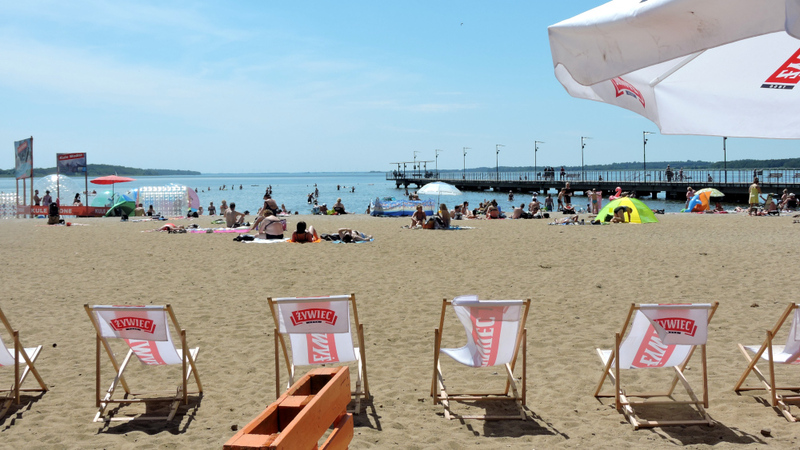 Today, the city is a much-liked holiday destination with a nice beach. And arrived in a very different Poland. 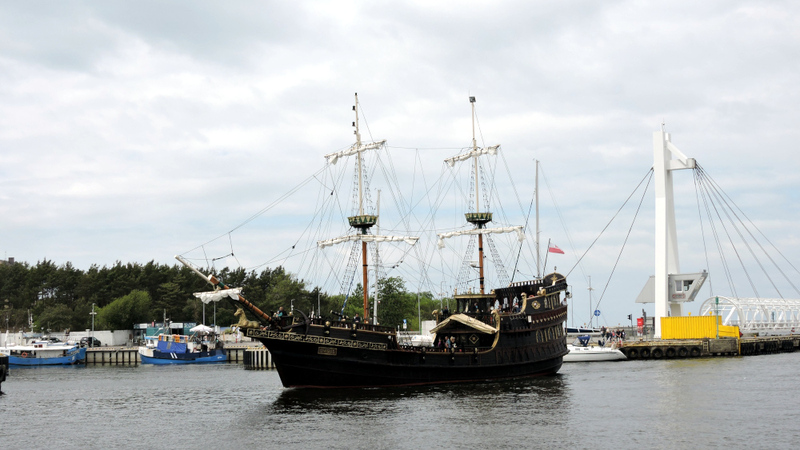 Gdynia is a large city with many glass and steel buildings. Very modern and of course bike paths. 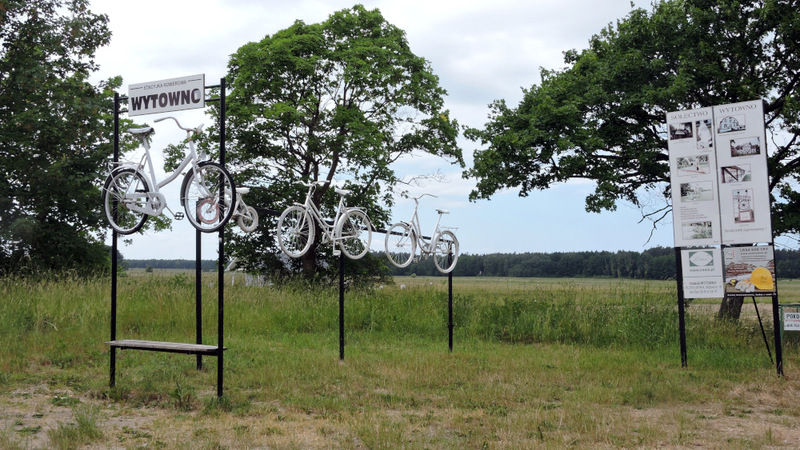 First, I rode through the forest and then past the old seaside town of Sopot. 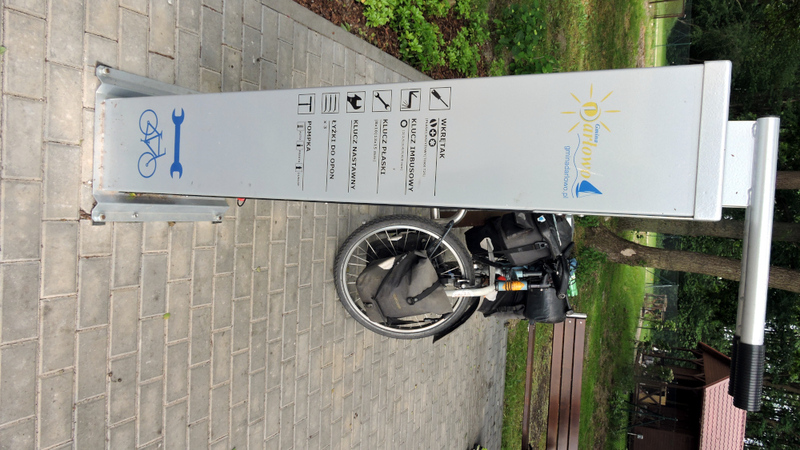 The bike path took me directly into Gdansk. The networks of trails in the city was about 600 kilometers and they were in great demand. 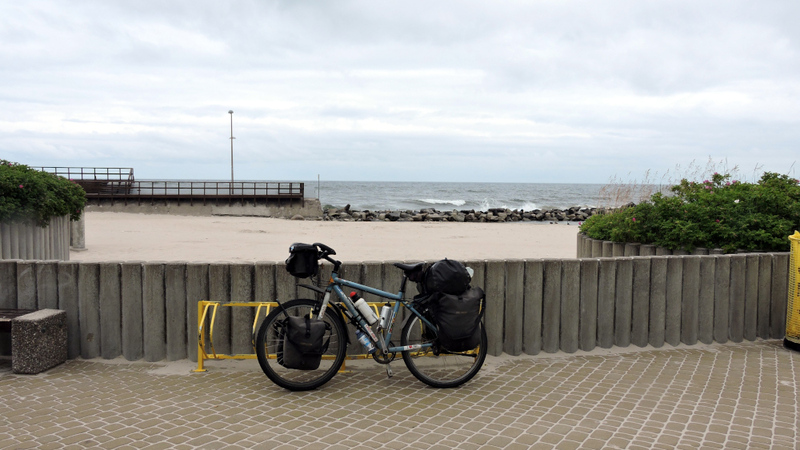 I didn’t have any problems to reach downtown and cycled past many old/new brick buildings to my camp ground on Stogi Beach, south of Gdansk. No question that I’d stay here for a while.